Celebrating kiddies’ birthdays can be a joyous and exciting occasion for children and parents alike. From sending invitations, shopping for goodies and the eventual party setup; it can all become quite an excessive process, accumulating a lot of waste. Why not make the environment and your wallet happy by throwing an eco-friendly birthday bash? Farewell Frozen, recycling is the new cool. Although handing out invitations is an exciting way for children to spread the word about their big day, paper invites can become unnecessarily wasteful. Sending invitations per email or Whatsapp will not only combat waste but they have the potential to be equally as alluring as paper invitations. Online poster/invitation creators such as Canva can be utilised to create beautiful invites you can send via email, text or social media. Some schools don't encourage paper invitations unless the whole class is invited as you don't want other kiddies to feel left out. If that’s not convincing enough then get this: it’s totally free, so you’ll be saving the paper in your wallet too. After a fun-filled day of festivities, who has the energy for a big clean-up? The first order of business is to avoid juice boxes and make use of a water and juice dispenser instead. You can make your own healthy drinks with rooibos and fruit juice, which will cut down on cost and packaging plus any unpleasant substances store-bought juice may contain. By not buying small juice boxes, you also avoid the small straws that come with them. Single-use plastic straws are an ABSOLUTE NO-NO. Only if completely necessary, use paper straws. Instead of using Styrofoam or paper cups, employ reusable plastic picnic cups. For older kids, make use of little jars for drinking. Jars are your best friend! They're reusable, versatile and bursting with potential so make sure you save them all up for those special occasions. Serving finger foods will eliminate the need for plastic utensils and paper plates. If plates and utensils are absolutely necessary, use the ones from your kitchen instead. If you’re worried about not having enough, hiring them or asking party guests to bring along their own clearly-marked ones would be the next best thing. You’d be surprised at how many people would be totally okay with this – after all, it’s for the greater good. If you do find that any of the waste accumulated at the party is recyclable, make sure the parents and kids know where the special bin is so these items can be reused/recycled in future. Also see: How to throw a party on a budget. Not only are eco-friendly parties a way to be mindful of the environment, they’re also a great way to get in touch with your creative side while having fun with your kiddies. Conventional décor such as balloons cause a lot of waste for something so temporary. They usually fly away and cause pollution, or get eaten by birds or small animals who subsequently choke. At a party, they deflate or pop anyway (most probably resulting in the tears of someone’s child). So bye-bye balloons, hello guilt-free décor. Try making party banners instead of using balloons. This gives a personal touch and you can make them as long as your heart desires. Paper flowers are also popular and they’ll leave your party guests in awe. Tea light candles in jars are always a winner and not only look pretty, but using lavender-scented candles or throwing lavender drops into your candles will keep those pesky flies away. If you love the rustic, earthy look, use branches, leaves and flowers as table décor. Environmentally friendly décor does not mean that it cannot be colourful! Splat a little paint on the decorations and use a colourful, reusable, wipeable plastic tablecloth and you’re good to go! What’s great about creating your own party décor is that it can be reused for so many different occasions. Forget plastic party packs filled with sugary goods that children probably would’ve had enough of at the party anyway and opt for a greener goodie bag. Create your own little DIY party favours from recycled material; they’re a lot more meaningful. 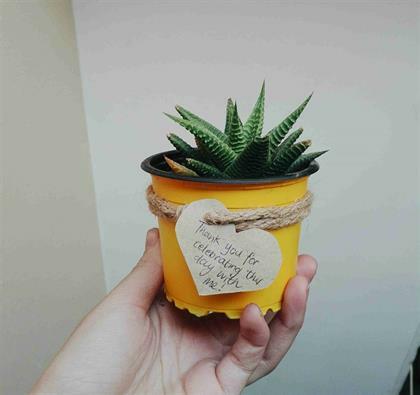 If you’re looking to purchase something instead, go for a mini succulent plant and personalise it by adding a ‘thank you’ note. Calling all little investigators! Scavenger or treasure hunts are a fun way to entice children and allow them to get in touch with nature. This is another fun activity in which you can use recyclable materials and have a little reward for the most inventive upcycled craft, showing children recycling can be a blast. You can never go wrong with conventional outdoor games such as on-on/tag or musical chairs. If you have space in your garden, plant a tree every time someone in your house has a birthday. The party kids will love crowding around where you've dug the hole, and they'll help you fill it up again. Throw some paper decorations on it and have a dance! A birthday party is a celebration of life. Having the means to celebrate your child is wonderful, but it is always important to be considerate of those less fortunate than yourself during these times – especially those who will probably never know the luxury of a birthday party. A good idea would be to request that party guests bring along something such as a toy or good quality second-hand item to donate to a children’s shelter instead of a birthday gift. Giving back teaches your child to be considerate of others even on days where it’s all about them, creating selfless little birthday bugs! Remember, green parties don’t have to be a drag. In fact, they’re a whole lot more rewarding than you think. Your children will grow to love these parties and you’ll be known for throwing the cutest little shindigs in town! Now that’s what I call a win-win situation. Do you enjoy recycling with your kids? What are some of your best recycling tips? Tell us by emailing to chatback@parent24.com and we could publish your comments. Do let us know if you'd like to remain anonymous.